and the new updated concealment booklet. either IWB (Inside The Waistband) or OTB (On The Belt) with ease. added security and quick release. mounting system. Fully leather lined, saddle stitched and molded to your gun. Elegant, compact and comfortable. For all medium and large frame semi autos. 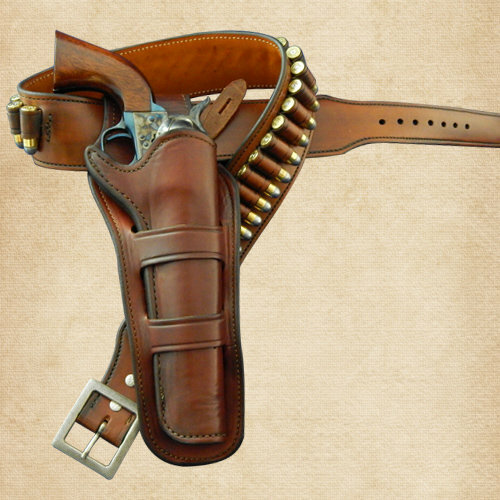 The Mexican Loop style holster is regarded as the origin of frontier period holsters for the new cartridge revolvers of the 1870’s. This reproduction model is a faithful re-creation of the most popular style from the American West. Fully leather lined and saddle stitched, wet molded for your revolver and available for all large frame single action revolvers. Offered in a plain finish only.